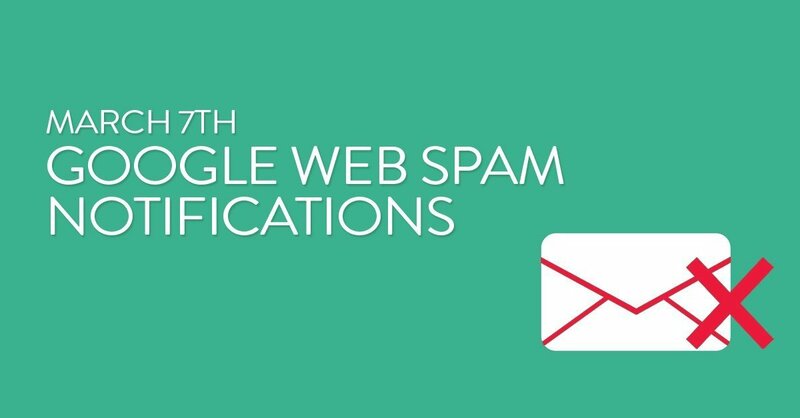 This guide outlines how to analyze the data in Fruition’s Google Penalty Checker Tool. 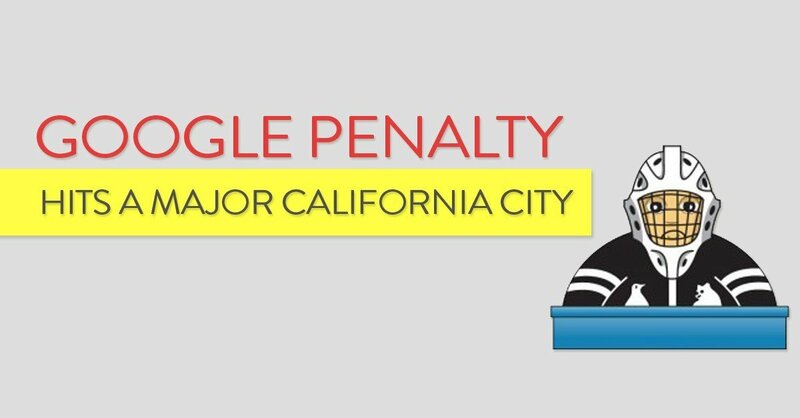 This guide applies to the Basic Plan (free) Google Penalty Checker tool. If you have subscribed to the paid version please see the enterprise guide. The first graph that you see looks like Figure 1 on the left, the Penalty Checker Bubble Chart. This chart gives you a big picture view of what Google updates impacted your website. twelve other variables that we add or subtract from the formula as accuracy dictates. How to read the penalty checker graph per domain? 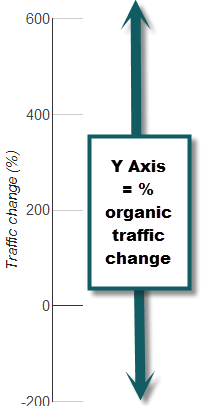 In Figure 2 (left) you will see the labels for the Y axis (the vertical axis) representing the % that your website’s organic traffic dropped as related to this particular update. 1. Consider the scale – Figure 2 shows how big changes vs little changes can make a particular update not seem as important. The top of the y axis is a 600% increase in traffic the bottom is a 200% decrease. This is a massive swing and taken from a real site in the penalty checker. Your scale will adjust depending upon your biggest increase and your largest decrease in traffic per update. 2. The basic plan does not take into account branded traffic. Branded traffic are searches for your brand name e.g. “Coke” or “Pepsi.” If you happened to have had a change in brand searches during this scale can be inaccurate. The paid version of the penalty checker factors in brand searches. The x axis (bottom of the chart) shows a date line. Note that some Panda updates may be different depending upon your domain. Google recently announced that they are rolling out Panda updates over a longer period of time; thus some search results may be impacted at different times. It may be as large as a month between when an update impacted one domain and another domain. When this occurs you may see a question mark over a date range where our algorithm detects a Google change but we are not able to pinpoint the date or what it is. If you do not see a question mark then we have not detected a change big enough to report. The more sites that we have the more accurate your predictions are. Thus, tell your friends about Fruition’s Penalty Checker Tool on Twitter, Facebook, Linkedin, etc because we all benefit. All of us our crowdsourcing to better understand Google. The size of the bubbles represent the probability that a particular Google update impacted your website. 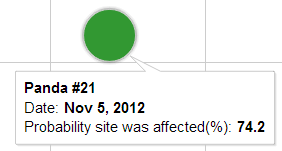 The size of the bubbles represent the probability that the Google update impacted your website. This ranges from 0% to 100%. 100% is rare but that would mean that it is statistically impossible that the change in your website’s traffic was random and not related to the particular Google update. The bubble on the left shows that there was a 74.2% chance that Panda 21 which was released on November 5, 2012 impacted this website. The green color represents that it was a positive impact. The size of the bubble corresponds with high likelihood of 74.2%. If the update’s impact was smaller the bubble would be smaller. If the impact was negative the color would be orange or red. If the impact was neutral it would be yellow. The color of the bubbles depict a positive, negative, or no impact on your organic search traffic quality. The color of the bubbles change depending upon how positive or negative the impact was. For simplicity we say that impact is equal to the quality of the traffic. Figure 4 below shows the color of the bubbles. How to use the bubbles? Use the size and color of the bubbles to focus on what your website was most likely impacted by. A big red bubble that is low on the Y axis (bottom of the chart) is a good place to start. A big green bubble that is high on the Y axis (top of the chart) may show that you have strength in one area e.g. content, site structure, or link building. 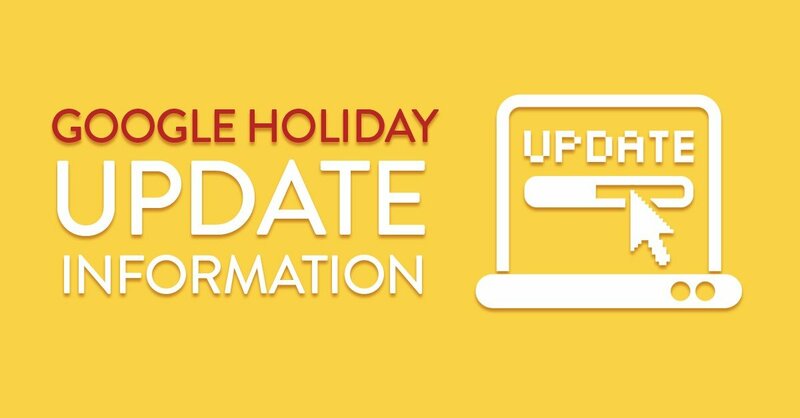 By looking at what the update was then you can improve your website to adjust for that particular Google update. What does it mean when it says “not enough data“? “Not enough data” means that YOUR website does not have enough traffic to make a solid statistical analysis of particular Google updates. This is not an error it just means that you need to get more traffic to your website before future Google updates for Fruition’s penalty checker to work.